Picture shows, left to right Andrew Faichney (Managing Director of Growers Garden), Alan Wallace (Commercial Manager of Growers Garden) and Martin Jenkins (Operations Manager of Growers Garden) at Peacehill Farm, Wormit. 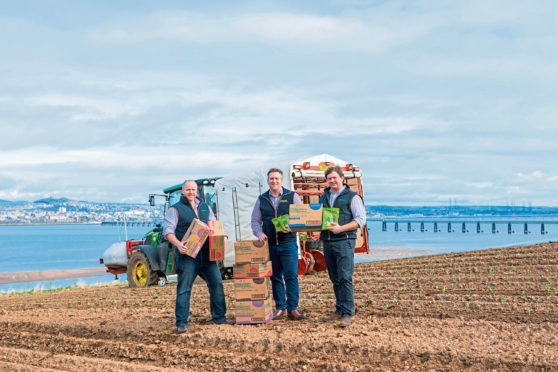 More than 50,000 bags have flown off a selected handful of shelves since the growers from a heartland of Fife, Perthshire and Angus launched their crisps on the market at the end of last year. That’s largely because these veggie crisps tick all the trendy boxes. They’re vegan, gluten-free and low in saturated fats. They come in a variety of flavours, and they rack up just 100 calories per pack. Just as importantly for East of Scotland Growers (ESG), the largest brassica co-operative in the UK , their expensive diversification project will help to make their core vegetable-growing business more efficient, less wasteful and consequently more profitable. Every year ESG members grow broccoli, cauliflower, sprouts, kale, cabbage and carrots on 6,000 of a combined 36,000 acres spread over a 180-mile stretch of Scotland. Their fresh whole-head loose broccoli meets around 15-20% of the UK’s retail demand and is supplied to Tesco, Marks & Spencer, Waitrose, Sainsburys and Morrisons from mid-June to mid-November, and at other times broccoli florets are freeze-dried for the frozen market. However, the freezing plants are only available to ESG between August and October as different vegetables take precedence in other seasons. After many years of experience, the broccoli operation is slick and efficient, but there is still waste, so last year, with a focus on better crop utilisation, the group of diverse farmers challenged their directors to find alternative markets for the wonky and undersize vegetables that don’t make the grade. Collectively they raised £2m to reach the stage where a new state-of-art crisp production factory was built in Cupar, Fife. 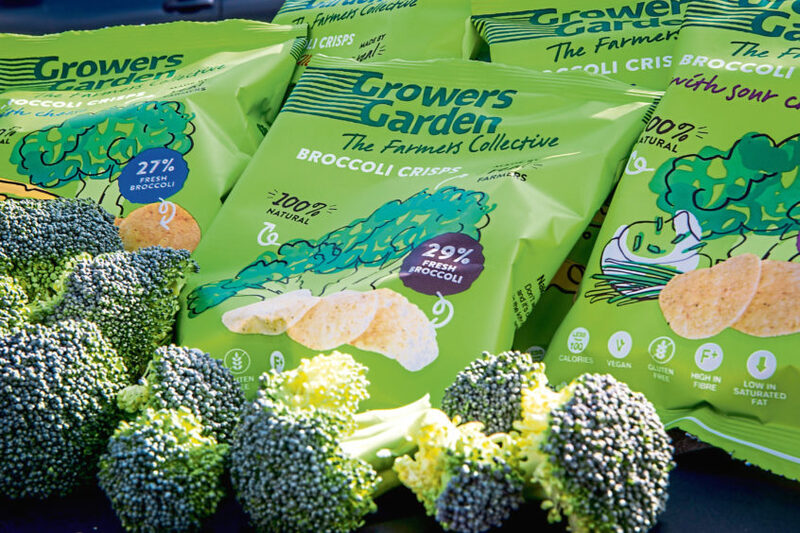 Broccoli crisps were developed and a subsidiary business – Growers Garden – was born. Growers Garden’s commercial manager, Alan Wallace, has been tasked with expanding this strand of the operation. He said: “We are taking undersize or wonky-shaped fresh broccoli , dicing it and pureeing it then processing it into a crisp pellet by mixing it with other raw ingredients such as potato flakes and potato starch, rapeseed oil and pea fibre. At the moment the crisps contain 29% broccoli and the goal, by June, is to get closer to 40%. The frying process, which takes place at a specialist plant in Essex, lasts just eight seconds in order to produce a crisp with low saturated fats. Feedback from consumers has been positive, leading Mr Wallace to anticipate further benefits for the parent business. “If we can utilise all the undersize and wonky crop we can improve crop yield and improve sustainability,” he said. “Long term, we hope it could also improve efficiency in the field. “Currently, in a good year there might be three passes of a field to cut the product, and in a bad year, where yields or head sizes are low, there can be as many as six passes, so that incurs high labour costs. Diversifying also feeds into the co-op’s strategy to minimise the impact of a looming labour crisis. Broccoli is hand-harvested in the fields with knives, and alternatives to the back-breaking work are still some way off. Scotland’s topography doesn’t help. “We are working with companies to develop machinery that will harvest broccoli, but the contours of our land are a challenge compared to other countries such as Australia,” said Mr Wallace. The crisps are available in four flavours – naked, chilli, cheese, and sour cream and chives – and can be found locally at outlets such as Edzell coffee shop, Balgove Larder and Loch Leven’s Larder. They are also for sale in Selfridges and the wholefood stockists Infinity Foods. Balgove Larder said the product had “hit the ground running” and had a great local story behind it. ESG is now working on producing the crisps in different shapes. “Maybe tortilla or teddy bear,” said Mr Wallace.